I was interested by the electricity in the air, the aggression and the disarray of those in power. Gillo Pontecorvo’s the Battle of Algiers is widely cited as the example of politically engaged cinema par excellence. Since the 1960s the Middle East and North Africa has continued to produce remarkable political cinema, not least in Morocco as Jamal Bahmad’s article in this series shows. Here, Martin Evans interviews Hicham Lasri, born in 1977, who is part of a new wave of Moroccan films makers. 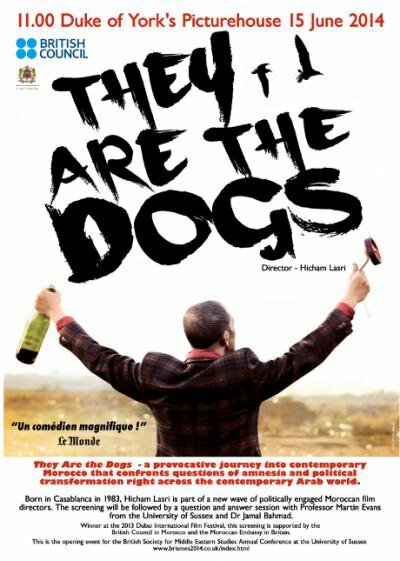 His latest film, They Are The Dogs, takes us through an unnerving journey into contemporary Casablanca; one that confronts questions of amnesia and political change rights across the Arab World. ME: How did you get into film making? HL: After law studies, I threw myself into writing scenarios that seemed to me to be the best way to convince producers to do my short films. At university, I wanted to write novels, in particular graphic novels inspired by the work of Robert E. Howard and Jack Kirby. I got down to doing this seriously after a knee injury while playing football, which sidelined me for a month and forced me to start writing. Then I had a period as a cinema reviewer in my early twenties thanks to the important critic Mohammed Bakrim. It was a formative moment when I published articles that were sometimes very biting about the films of “old directors’ who are now my colleagues... some film makers still remember my youthful ferocity in the cinema sections of the Moroccan press. Meeting Vincent Mellili, founder of the first cinema school in Morocco was decisive, as well as the filmmakers Omar Chraibi, Hassan Legzouli, Emmanuelle Sardou and Nabil Ayouch who helped me make my first short films. ME: Why did you make They Are The Dogs? HL: The position of someone who is creative is that of an observer: an emotional historian who focuses less on the facts or the veracity of the information in order to concentrate on the senses, the transcription of an atmosphere, of a human truth. As a storyteller, I am a soldier of history, I try to inscribe my films into a precise context in order to amplify the issues at stake. The Arab Spring, the death of Hassan II or the bread riots are only some of the possibilities of typically Moroccan events that one can use to at the same time make a film and highlight certain human dramas. In 2011, I witnessed the streets protests on the streets of Casablanca and then across the Arab World on the television. I did not want to make an opportunist film on the Arab Spring, but I was interested by the electricity in the air, the aggression and the disarray of those in power. Quickly I thought up a story that took me back to a Moroccan event where the people were expressing their discontent: I am speaking of 1981 and the famous bread riots. The parallel between the two moments was easy enough to establish. There was a gap of thirty years between 1981 and 2011. That corresponded to a generation. The rest was a mixture of research, inspiration and aesthetic interpretation. ME: Did you meet any difficulties given that the film is clearly made on the spot? HL: Not really, in the sense that the narrative sought to capture the chaos and even to encourage it. We wanted to give the impression that the events were caught live and for that we worked hard to create a sense of urgency and improvisation. Casablanca is a magnificent city because of its vivacity, aggression and sometimes it poetry, so it was a dream to be there with a camera in order to capture certain moments that the city offered up to us..
ME: What has been the reaction to the film in Morocco? HL: The film only came out in March, but the film has been shown at the Cannes Film Festival and two film festivals in Morocco, has won two prizes and was acclaimed at the Marrakesh Film Festival. The critical reactions have been very enthusiastic. There is a special showing of They Are the Dogs at the Dukes of York’s Cinema, Brighton at 11.00 am on 15 June 2014. The screening will be followed with a question and answer session with Martin Evans, Professor of Modern History at the University of Sussex, Jamal Bahmad, film historian, and Imad Fijjaj, one of the actors in the film. The screening is the opening event of the British Society for Middle Eastern Studies Annual Conference at the University of Sussex 16-18 June 2014 and is supported by the British Council in Morocco and the Moroccan Embassy in the UK.